Paul T. Glessner has worked as an aerospace engineer in varying capacities for Boeing-Vertol, Grumman Aerospace, Lockheed - Burbank, McDonnell-Douglas, now Boeing, and ATK on such projects as the CH-46/47, F-14, classified projects, S-3,P-3, accident investigations, High Speed Civil Transport, B-717, MSST, and the Space Shuttle in such disciplines as Stability, Control & Flying Qualities besides Aerodynamics, Flight and Wind Tunnel Testing and Flight Controls. Paul not only has 300 hours jumpseating in airliners' cockpits pre-9/11, he also flew with the Chief Pilot of British Airways on the Concorde in the cockpit from New York to London and back. He has been flying since he was 16 years old holding an FAA Commercial License with Instrument and Multi-engine Land ratings. Paul did a two and a half year stint as a Principal Engineer-Specialist overseeing the handling qualities of the recently made operational -USAF's number one program, the F-22 Raptor fighter plane. 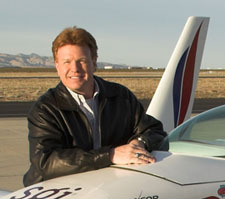 Paul was the Chief Aerodynamicist at XCOR Aerospace at the Mojave Spaceport designing Lynx, a sub-orbital spaceplane, which was seen both on the cover of Aviation Week and in the news recently offering the public rides; he founded a more formal aerodynamics department there with services provided by CFD experts and a top-level computer company. Paul was a mission systems flight test engineer while working for Lockheed Martin on the F-35 Joint Strike Fighter Program at Edwards AFB. He is currently consulting to the automotive and aerospace industries after recently serving as an aerodynamics consultant on ATK's Multi-Stage Supersonic Target (MSST) and Mooney International's all new composite M10 aircraft for over a year at each assignment. Regarding cars, Mark Donohue was Paul's idol growing up in the late 60's. Paul starting writing to Mark at age 6 after viewing a Penske Racing press release his father who worked at the team's prime sponsor, SUNOCO (Sun Oil Company) as their corporate architect, had brought home from work. Paul wrote telling Mark that he wanted to be a race car driver, too. Five years later after Mark won the 1972 Indy 500, he presented Paul with his Team Penske/Sunoco uniform (click Mark Donohue to view the suit). It has been adorning the walls of the Petersen Automotive Museum in Los Angeles, California. Upon learning of Mark's crash during the 1975 Austrian Grand Prix's practice, he mailed a blessed Miraculous Medal to Mark in the hospital. Unfortunately, Mark passed and Paul was able to serve his funeral as an altar boy. It was from then on that he corresponded with Roger Penske. Roger called Paul at Penn State University to learn more about the wing design that Paul apprised Roger's secretary about. Roger Penske and Derrick Walker raced the wing design Paul initiated in 1981 for both the cars Roger fielded in the 1983 Indy 500; the cars placed second and third. Paul was 20 y.o. when he got the call from Roger. Click on Mark Donohue to learn more about Paul's unique relationship with America's past racing hero. He then oversaw two Penn State colleagues wind tunnel test Bob Leitzinger's Camel GTU 280ZX and found drag and downforce concepts that helped Bob win two national championships the following years. In the late 90's Don Prudhomme, Dale Armstrong and NHRA extended the fun factor immensely as he interfaced with the teams both personally to increase speed and reduce drag and on behalf of the sanctioning body, N.H.R.A., for the benefit of drivers' safety and rules changes. Paul felt he reached a level of competence after having taught vehicle aerodynamics at one of the U.S.'s top three art center's transportation department - Art Center College of Design in Pasadena, California. (letter of recommendation) Paul was the Lead Aerodynamicist for a U.S. attempt led by Bill Fredrick, who designed the Budweiser Rocket car, to bring the World Land Speed Record back to the States from the British in April '07 - 800 m.p.h.! That effort was halted unfortunately but three S.A.E. technical papers were generated regarding CFD investigations. Currently, VAC was asked to join Craig Breedlove's team for their U.S. assault on the World Land Speed Record. Paul was most grateful of the opportunity to continue making vehicles go - faster. The invitation from the financier himself took place at AutoClub Speedway's Media Center March 2017; stay tuned. Paul is a member of S.A.E., S.F.T.E., A.O.P.A., M.P.G., and A.A.R.W.B.A. Paul has received awards from Boeing, the U.S. Air Force, JT3, L.L.C. and NASA. He has both a B.S. from Pennsylvania State University and an M.S. from Polytechnic University-Brooklyn in aerospace engineering. These aforementioned experiences allows Paul the ability to speak on both sides of the aerospace/auto racing fence when giving his seminars. That is a very rare attribute that only benefits the attendees. Resume, letters of recommendation, references and additional pictures upon request. All contents on this site are Copyright © 2015 Vehicle Aerodynamics Consultants, Inc.